You find the Accessories folder by pointing to and single clicking on the button located on the bottom left of your screen. Wait a second or two until the menu opens. Now slide your mouse up to Programs. 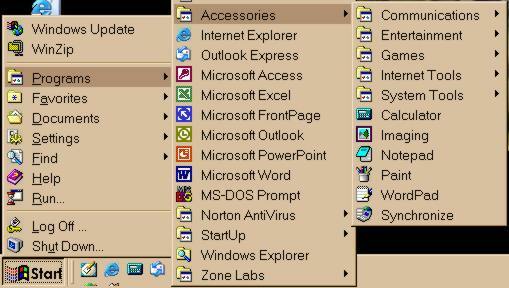 Again wait, when the menu opens, find the Accessories folder, then slide your mouse pointer to it. If you would like to know more about each option under this folder, using the diagram above, slide your mouse to the desired subject, then single click. This program is exactly like any standard calculator. You can use your keyboard or mouse to input numbers and do the operations. Should you want to use the keyboard, keep the following in mind. The Escape key will act as the Clear key. Kodak imaging is a program that you can use to view your picture files. Although, you cannot change any part of a picture, you can rotate it and save a picture under a different name. Notepad and WordPad are simple text editing programs. They are designed to edit small files that do require any special coding.